Several new developments are underway at Boto Waterworks. Stay tuned for future updates! Poorly-informed activists are teaming up to ban hydroponics from organic farming– even when it follows organic practices like no use of pesticides or synthetic fertilizers, and having a thriving, disease-fighting flora on the plants’ roots. This campaign puts aquaponics in the crosshairs. Aquaponics is an emerging technology where fish are grown sustainably in tanks, and their wastes are recycled to grow plants instead of dumped into the environment. It uses 95-98% less water than growing in soil (yes, even organic farming in soil); eliminates pollution from aquaculture; and can grow local food anywhere, including deserts and cities where soil farming is impossible. Aquaponics also supports a rich and health-promoting root flora when managed properly, just like farming in soil; and pesticides– including many “organic approved” pesticides– cannot be used because they will harm the fish. All this sounds like an organic dream come true. And still, forces are lining up to ban it from being certified organic. I’m not a mind-reader, so all I can do is speculate. But what is clear from this article is that a main driver is established organic farmers who are afraid of competition. The article alleges that their main fear is “protecting organic integrity” from “foreign competition”– that somehow, megacorporate greenhouses in other countries are using synthetic fertilizers and pesticides and still being certified USDA organic. Folks, that’s just embarrassing. If these “organic activists” are worth their salt, they know that the USDA organic rules are the same no matter what country you’re in. The only way non-organic greenhouse products like this could be getting USDA certified– in any country– is if the certifying bodies are breaking the law. And if that’s the case, then organic farmers would know that the way to fix it and protect organic integrity is by getting the USDA to enforce the rules it already has on the books. Not by lobbying it to make brand-new ones. So call me a skeptic, but I don’t think “foreign competition” is what it’s about at all. I don’t think it’s any coincidence that this lobbying push is happening right as urban agriculture starts to become economically competitive. This lobbying effort isn’t about “foreign competition.” And it’s not about “integrity.” It’s about domestic competition from upstart, young, urban farmers. Who– by the way– are a lot more female and a lot less white than the rural ones. Good ol’ boys and protectionism: 1. Sustainability: 0. Want to let lawmakers know you do not approve of this nonsense? Put your name here for a one-way ticket to the USDA’s review desk. Congratulations to Boto Waterworks client Falling Waters Farm on receiving their organic and food safety certifications! FWF is an all-indoor aquaponic farm in Indianapolis. I have to say this group was fantastic to work with— dedicated, professional, and committed to everything about aquaponics– including the tedious background stuff that it takes to be truly successful. That helps explain the 100% grade on the food safety certification. Seriously. FWF is on a whole ‘nother level. 1. It can definitely be done! 2. It helps to get an organic certifier who knows aquaponics. 3. Start planning for food safety as soon as you know you’ll need certification—preferably before you start to build. It’s really easy to build an AP system that will never pass an audit and then you’re stuck. Don’t let this happen to you! FWF didn’t. They planned ahead. They’re happy. Give your farm a chance to be happy too. 4. The food safety audit we used was USDA Harmonized GAP with an aquaponics addendum. Lack of financial information is of the biggest stumbling blocks in aquaponics. University of Hawai’i recently released a tool that should help with that: a financial modeling tool for aquaponics. This tool is an Excel spreadsheet built from real-life data. UH scientists collected info from a number of AP farms in Hawai’i to learn how individual financial components– like labor costs, price of materials, etc– affect financial outcomes. Of course most locations have very different costs of living, shipping, and food prices than Hawai’i, so the model allows for you to input costs for your own area. UH also has a cool little presentation on basic AP costing from two farms in Hawai’i in Guam. It’s eight minutes and a really great demo of how different market conditions can drastically affect the profitability of an individual farm. 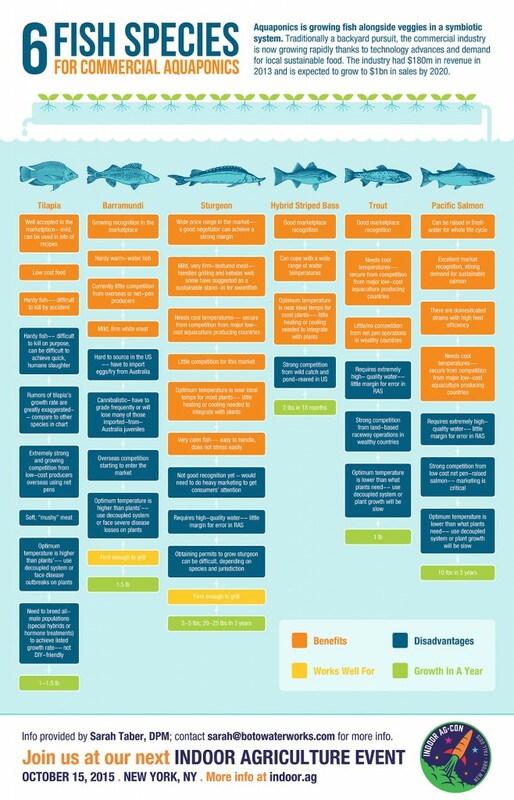 I’m happy to announce, with Indoor Ag, this very cool infographic about different types of fish for aquaponics. The fish used in aquaponics will have a huge influence on both the engineering and marketing approach, yet there’s not a lot of information out there about how species choice affects an operation. Voilà! The infographic was born. Aquaponics is a compelling concept, but solid technical information can get lost in the romance. * Indoor Ag is all about the nuts and bolts of making aquaponics, and other areas of indoor agriculture, work. If you like this infographic, check out their white paper on indoor agriculture, their general resources page, and their upcoming conferences in NYC and Las Vegas. *Did you know that by the time water’s warm enough for tilapia to grow at a commercially viable rate, it’s too warm for lettuce? You’ll wind up with catastrophic losses from Pythium root rot at those temperatures. (That info’s available for free from university extension publications and public libraries. Yet I’ve never seen a single aquaponics class, equipment supplier, internet forum, or “guru” mention the temperature problem. Think about that for a moment.) It’s a real pleasure being able to work with Indoor Ag to help overcome some of these informational hurdles and get urban and indoor agriculture moving forward.